As good ‘ol Carl says, “If it doesn’t get all over the place, it doesn’t belong in your face.” And it couldn’t be more true with these sweet and tangy, tender Slow Cooker Sloppy Joes! 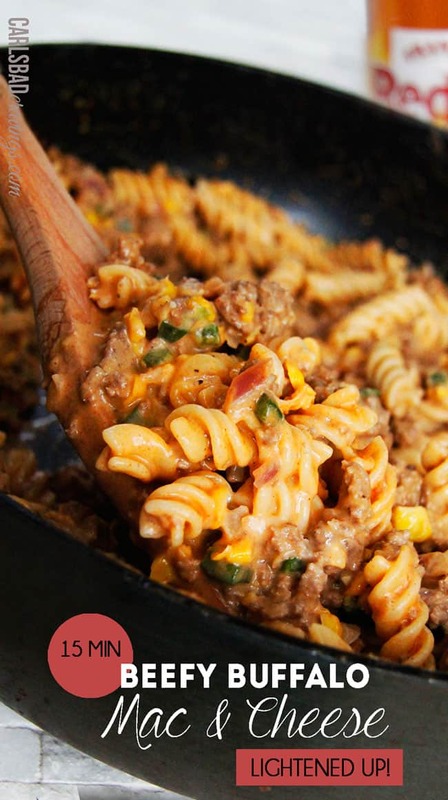 They are so easy and srumptious for a crowd, weekday meal, leftovers or even to freeze. A couple weeks ago, I bought 16 pounds of pork shoulder from Costco in order to make my Asian Caramel Pork. Caramel pork does not requre 16 pounds of pork. So with pork in the freezer and my imagination at full attention, I started brainstorming what I could make with my pulled pork. 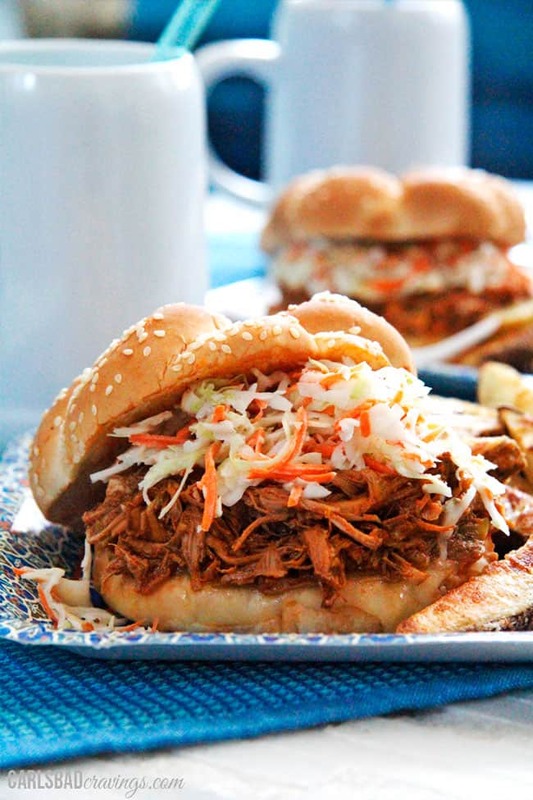 Sweet Pulled Pork (Cafe Rio Style on STEROIDS, coming soon) is a given, and then I thought of Pulled Pork Sloppy Joes. And I’m so glad I did. Growing up, my mom always whipped up a big batch of homemade Sloppy Joes for casual big get togethers. 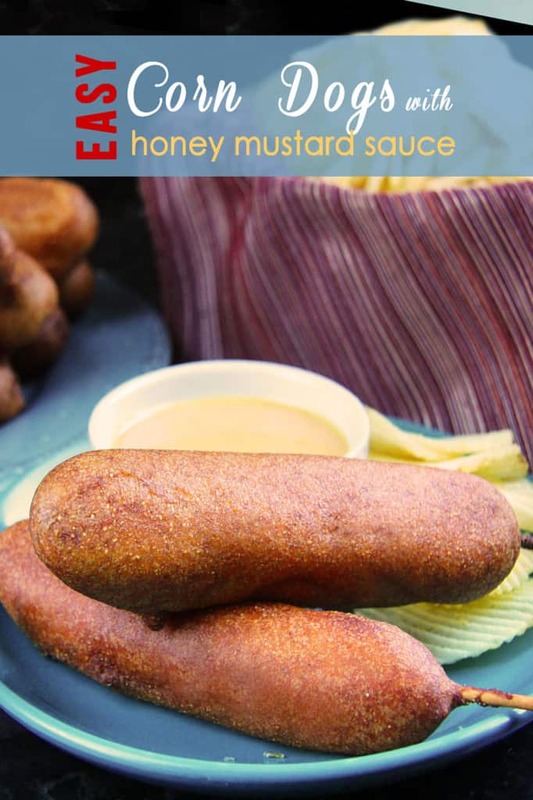 Her sweet and tangy, barbecue-like sauce was so addicting, I would eat any leftovers for breakfast, lunch and dinner. These Slow Cooker Pork Sloppy Joes are packed with the same lip-smacking goodness – and even easier. 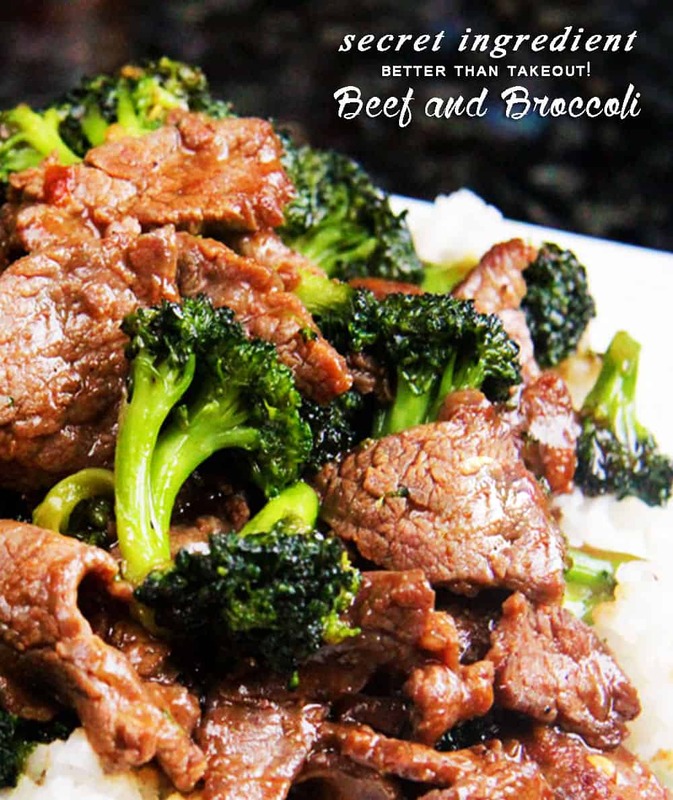 No browning onion, meat, etc., simply throw all the ingredients into the crockpot. Done! 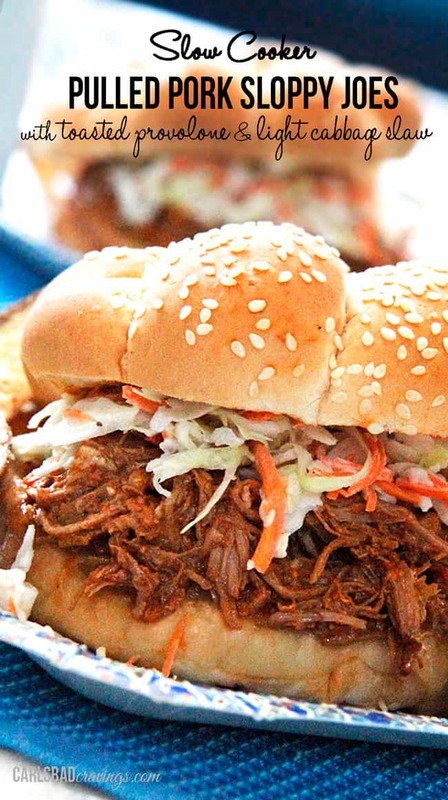 I added provolone cheese to the buns and then broiled them, because everything is better with cheese, and then topped the pulled pork with light coleslaw which adds the perfect crunch to the Sloppy Joes, and makes them even sloppier. And in my experience, the sloppier to eat, the tastier. Although I have to say, with finger/hand foods, I am pretty much a mess. Patrick had to teach me how to “correctly” hold a sandwich, taco/burrito with the end away from you angled upward so the juice wouldn’t drip all down my hands. It helped, somewhat. 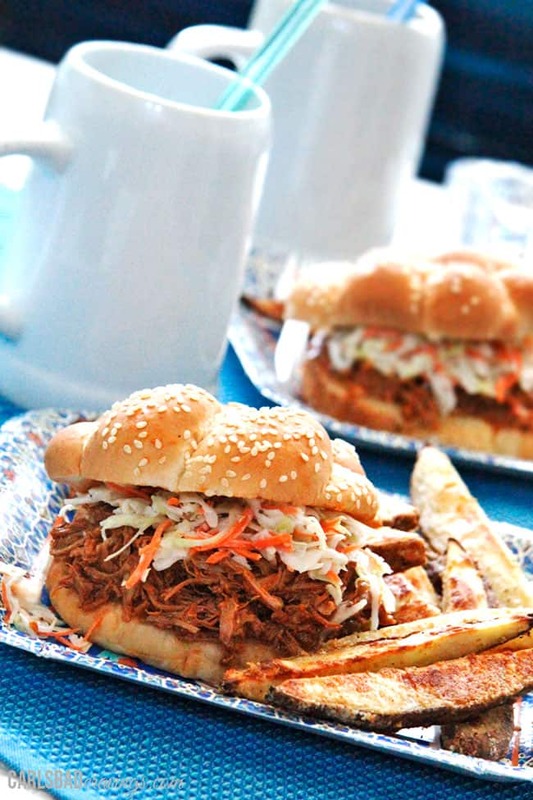 Slow Cooker Pulled Pork Sloppy Joes. Guaranteed to be sloppy. Guaranteed to belong in your face. 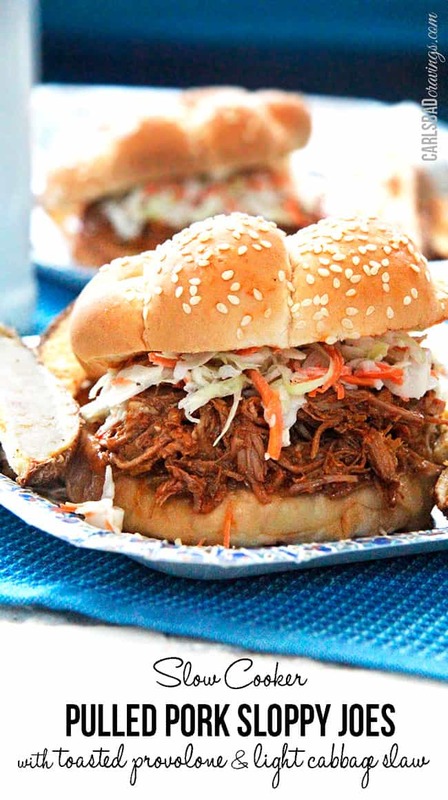 Pulled Pork: Spray your slow cooker with non stick cooking spray. Add all of the pulled pork ingredients and stir. Cook on high 3-4 hours or on low 6-8 hours. 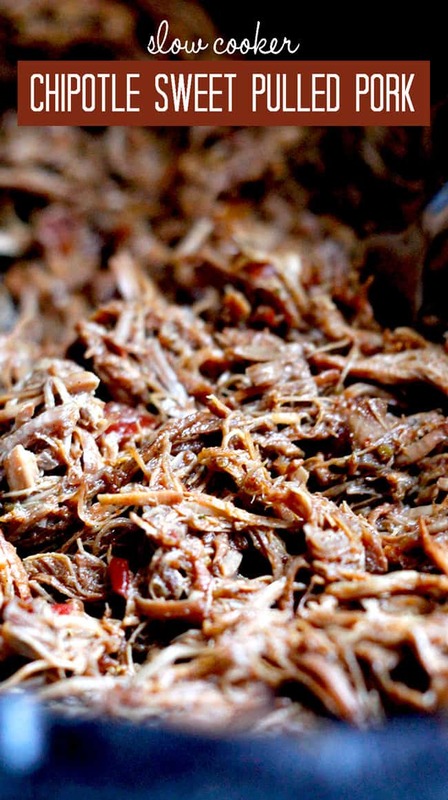 When tender, shred pork and allow to cook an additional 30 minutes, or until the pork absorbs the excess liquid. Coleslaw: Add ingredients to a large bowl and mix until well combined. Taste and add additional sugar, vinegar, salt to taste. Buns: When ready to serve, lay bottom of buns in a single layer on a baking sheet. Top with sliced provolone and broil until melted, approximately, 1-2 minutes. 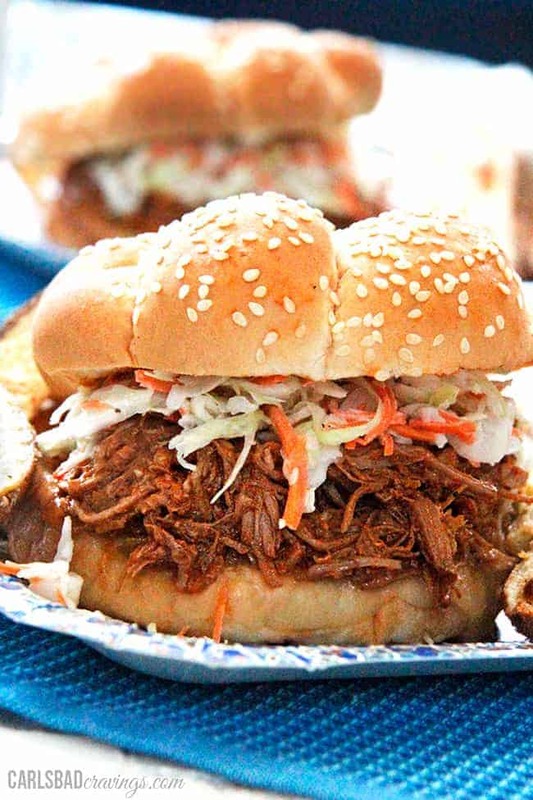 Assemble: Top provolone buns with shredded pork followed by coleslaw. I like the way you explain how messy you are and then, you list a number of recipes that look like they are also very messy to eat…can I assume you believe in misery loves company? A friend of mine invariably always has stains on her clothes from eating…I should send these recipes to her. I knew you were a kindred soul when you mentioned eating your mother’s sloppy joes for breakfast, lunch and dinner. If I make something that I love, I can eat it for every meal! I know some people cannot understand eating unusual foods for breakfast, but if I like something, the time of day doesn’t matter. Am going to try this recipe. You had me at-” No browning onion, meat, etc., simply throw all the ingredients into the crockpot. Done!” My kind of recipe, thanks! LOL! I love the idea of sending these recipes to your messy friend. She will inevitably have even more stains on her clothes 🙂 I rarely have “breakfast” food for breakfast when they are tasty leftovers, otherwise I will just keep craving the leftovers and have 2 breakfasts! Love that you get me on that one 🙂 I hope you enjoy this recipe and have a fun, messy time eating it as well! PS You are delightful Susan, I love your comments! 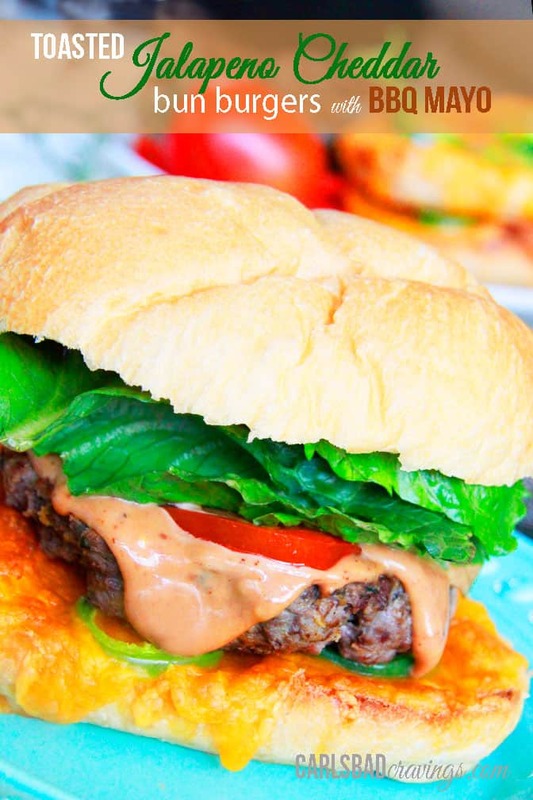 Another amazing looking recipe!! LOVE it! Your photos are gorgeous too! You come up with the most unique combinations! I’ve never thought to do sloppy joes with anything other than ground beef, but really? Why not? I bet it is just as good, if not better, with some juicy pulled pork! Hi Nicole, thank you! I try and think of flavor combos that I think would be delicious and then figure out how to make them 🙂 And yes, juicy pulled pork is just as delicious! well hello deliciousness! I was surprised how the coleslaw completed the sandwich. Super yummy!! Thanks Layne! I love this coleslaw – its my go-to! I am excited to try this, but I am also intrigued by your Asian Caramel Pork. Where’s that glorious sounding recipe? !